Vermont suffers no shortage of twang. From Starline Rhythm Boys to the Lowell Thompson Band, to various Brett Hughes or Mark Legrand-led projects and a plethora of variously country-tinged outfits in between, the Green Mountains State is an Americana hotbed. The latest entry to the (alt)countrypolitan fold comes by way of Montpelier quartet Erin McDermott & The Dixie Red Delights. The group, which also includes double bassist Jen Wells, drummer Ben Roy and guitarist Doug Perkins (Smokin’ Grass), is already a favorite in the state’s hot pickin’ epicenter of central Vermont. And with their debut album Bear Hoot — released on the capital city’s Halogen Records — it’s easy to see why. Led by vocalist-songwriter McDermott and her formidable pipes, the band trades in upbeat, mostly agreeable grooves. Swingin’ album opener “Never a Kid” sets the standard with a toe-tapping country-blues shuffle. Perkins is typically immaculate, unleashing fiery acoustic licks throughout. Purists and snarky critics may find the tune falls a little too close to jam-pop for comfort. But, hey, it’s got a beat and you can dance to it, which should be plenty good enough to satisfy The Point FM crowd. “Time Remains” follows and, depending on your predilection for bouncy groove-pop, is either generically uplifting, or nauseatingly saccharine. In either case, the tune is the blandest of the disc’s 14 cuts. But it gets better. And quickly. McDermott almost lost me with the next track, “Renewable Vermont Hippie Dream.” Given the earnestness of the previous offerings, the song’s wince-inducing road-trip-rock feel might have some listeners scrambling for the fast-forward button. But hang on a sec. The tune is not a sugary ode to hippie livin’. It’s a tongue-in-cheek condemnation. And a damned good one. 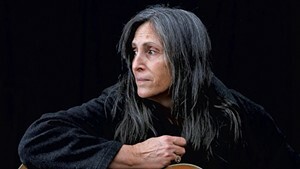 McDermott unflinchingly takes aim at the state’s not insignificant pseudo-hippie set and likely harshes more than a few mellows — and in turn, mellows a harsh rock critic. Following Perkins’ deliciously ironic Yngwie Malmsteen-inspired double-guitar shredding — no, really — she closes the song by stating, “And we are all living / the renewable Vermont / hypocritical Vermont / Trustafarian Vermont hippie scene.” OK, Erin. You got me. On the remainder of Bear Hoot, McDermott proves to be one sassy songwriter. While the album does not lack for sappy moments (“Spring Has Sprung,” “Weeping Willow”), it largely delivers catchy, sturdily constructed Americana and is ultimately a fine addition to Vermont’s ever-growing population of twang-infused acts. 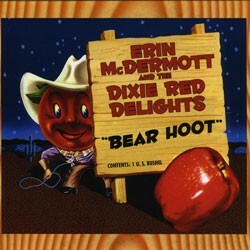 Erin McDermott & The Dixie Red Delights celebrate the release of Bear Hoot this Saturday at Montpelier’s Black Door Bar & Bistro.